St. Patrick-St. Vincent Catholic High School evolved over the span of a century from what was originally the Catholic Free School, established in 1870 by St. Vincent Ferrer parish in Vallejo. The first graduates received diplomas in 1880. The school was renamed St. Vincent Ferrer, affectionately known as "Saints," and remained a co-educational high school until June 1968, serving students from the greater Solano County (Benicia, Fairfield, Napa, Vacaville, and Vallejo) and from West Contra Costa County. At the urging of Monsignor Thomas Kirby, the Diocese of Sacramento opened a second school in September of 1968, St. Patrick High School for boys, at the current location on Benicia Road, and made St. Vincent Ferrer an all-girls school. St. Patrick’s enrolled the freshmen, sophomore and junior boys from St. Vincent Ferrer, but the senior boys in the class of 1969 elected to stay and graduate with their female classmates. During the succeeding years, the two high schools shared social events and sometimes faculty and instructional resources. Eventually they organized several co-ed athletic teams together. In 1983, the changing demographics of Solano County, the rising cost of Catholic education, and an expanding student body necessitated some long range planning, and the decision was made to merge St. Patrick and St. Vincent High Schools as a co-ed school once again. 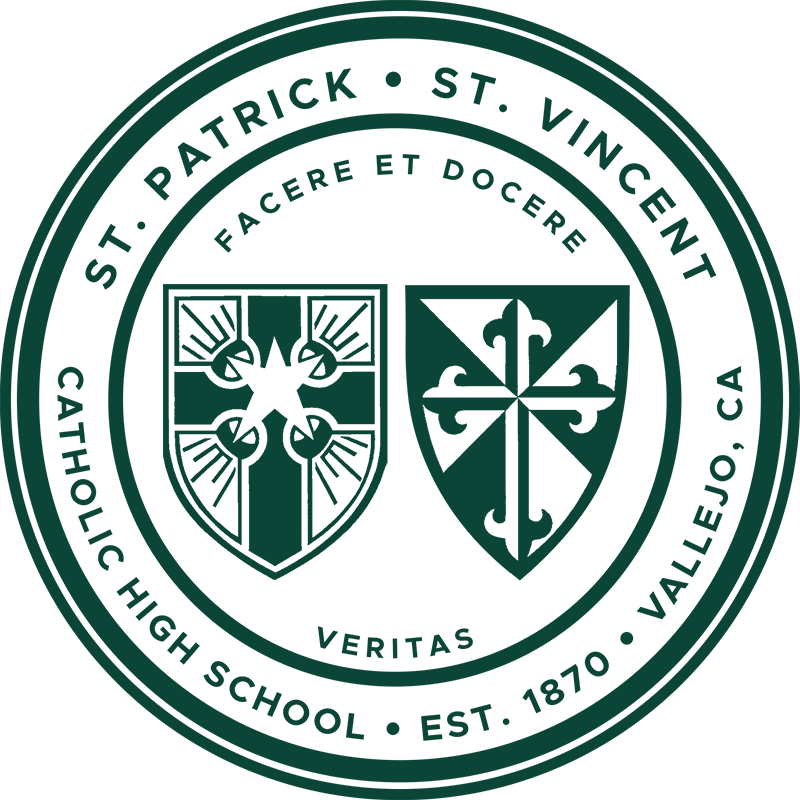 The groundbreaking for a new classroom facility took place on October 18, 1986, and the school reopened in the fall of 1987 as St. Patrick-St. Vincent Catholic High School. The Dominican Sisters of San Rafael administered St. Vincent Ferrer High School under the auspices of the Diocese of Sacramento. The Congregation of Christian Brothers (formerly known as the Christian Brothers of Ireland) administered and staffed St. Patrick High School. After the merger of the two schools, the Christian Brothers and the Dominican Sisters continued to serve in both administrative and teaching capacities. In 1993, when the Christian Brothers withdrew from St. Patrick-St. Vincent High School, the Diocese of Sacramento assumed the responsibility for school administration. The traditions of both the Christian Brothers and the Dominican Sisters serve as a strong foundation upon which St. Patrick-St. Vincent Catholic High School will continue to fulfill the mission of Catholic education in Solano County in the 21st century. The school crest of St. Patrick-St. Vincent High incorporates the shields of two of the schools from which we evolved and the orders that stewarded them: St. Patrick High School and St. Vincent Ferrer High School. In the upper left hand corner of the crest is the shield of the Christian Brothers, who administered St. Patrick High School before the merger with St. Vincent Ferrer. The star in the crest is a reminder that “those who instruct many unto justice shall shine as stars for all eternity.” The star is set upon a Celtic cross, the source of the inspiration of faith and the instrument of redemption. In the lower right hand corner is the traditional Dominican shield, representing the order who administered St. Vincent Ferrer High School. Having its origins in medieval times, the shield's "cross fleury" signifies fruitful victory, duty, and self-sacrifice. The alternating dark and light represent various qualities. The dark stands for silence, wisdom, and fortitude; the white for peace, purity, charity and sincerity. 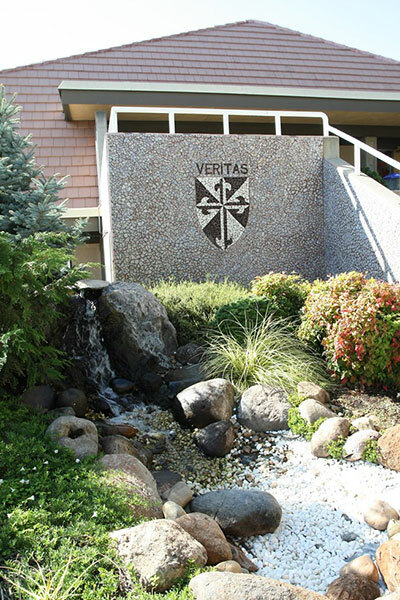 The two mottos "Veritas" (Latin for "Truth," the motto of the Dominican Order) and "Facere et Docere" (Latin for "To do and To Teach," the motto of the Congregation of Christian Brothers) represent the essence of Catholic education provided by St. Patrick-St. Vincent: to lead young people to the knowledge of the truth and to reflect the charity of Christ in the many processes of instruction.